Home / police violence / #JusticePourTheo Statement: Solidarity with #Théo & every victim of police abuse! No to the “Public Security” law! #JusticePourTheo Statement: Solidarity with #Théo & every victim of police abuse! No to the “Public Security” law! The Coordination of Arnarchist Groups (CGA) affirms its solidarity with Théo, who was raped, beaten and insulted by four policemen on the second of February. We also affirm our solidarity with people who has shown and keep showing their legitimate outrage against police in Aulnay and others municipalities of Seine-Saint-Denis. We denounce the use of violence by the police against protesters, in particular the warning shots using live rounds during the night from the 6th to the 7th of February, as well as all the arrests and the criminal convictions. 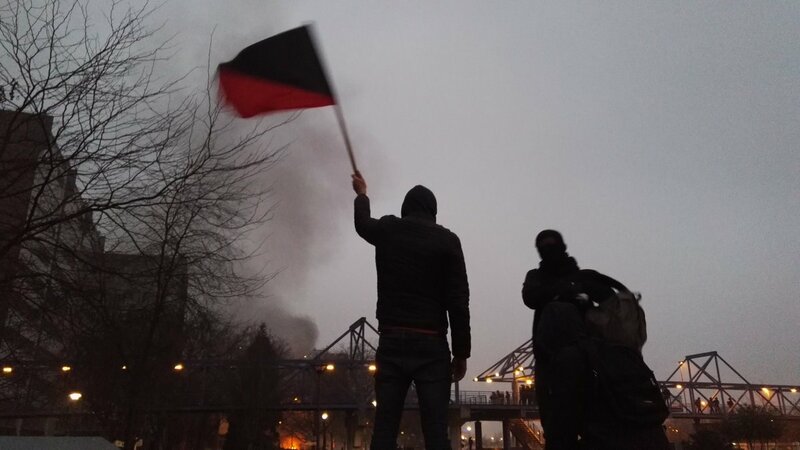 On Saturday the 11th of February, demonstrations against police violence and in solidarity with Théo were organized all over France. Thousands of protesters gathered in front of the Bobigny court where the were heavy clashes and repression. The Coordination of Arnarchist Groups (CGA) affirms its solidarity with Théo, who was raped, beaten and insulted by four policemen on the second of February. We also affirm our solidarity with people who has shown and keep showing their legitimate outrage against police in Aulnay and others municipalities of Seine-Saint-Denis. We denounce the use of violence by the police against protesters, in particular the warning shots using live rounds during the night from the 6th to the 7th of February, as well as all the arrests and the criminal convictions. This Saturday the 11th of February, demonstration against police violence and in solidarity with Théo were organized all over France. Thousands of protesters gathered in front of the Bobigny court where the repression was very severe. The abuses suffered by Théo cannot be considered as an individual case: over and beyond the beating and injuries, some surveys show an average of 10 to 15 deaths linked to the police each year (there is no official statistics on this subject). Let us remember the most newsworthy ones such as Zyed and Bouna, Wissam El Yamni, Rémi Fraisse and Adama Traoré. The impunity following these cases enforces the all powerful feeling of the police that always goes further. The police willingly relays the State racism that is being institutionalized and moreover trivialized through the laws, the practices and the speeches. Cop racism expresses itself shamelessly in the working-class districts where racial profiling and more or less violent humiliations are common. The endless state of emergency gives the police more and more powers without almost any judiciary control. The State asked its police to increase the repression and the violence against the “work act” protestation. These rules contributed to unleash the cops. Last fall, during their “protestations”, cops asked for additional resources, a “greater freedom of action against offenders”, and an extension of the self defense framework. This was welcomed with kindness and attention of almost all the political class and the government which increased the budget by 250 millions € and is actually discussing the enactment of the widening of the self defense framework for the police. Cynicism breaks every boundaries when, on Wednesday the 8th of February, while Théo is still in the hospital, the National Assembly enacts the “public security” act, which softens the rules of self defense for the cops, raises the jail duration for assault on police and authorizes the investigators to remain anonymous. This law also states that cops could use their weapon “if threatened by anyone carrying a weapon” (without defining the weapon types) or “when they cannot defend in an other way the position they keep”. All this blur can only leads to other tragedies. We demand the end of police impunity, the repeal of the “public security” act, the lifting of the state of emergency and the abrogation of all security laws. Don’t let our rights and social conquests be trim away!